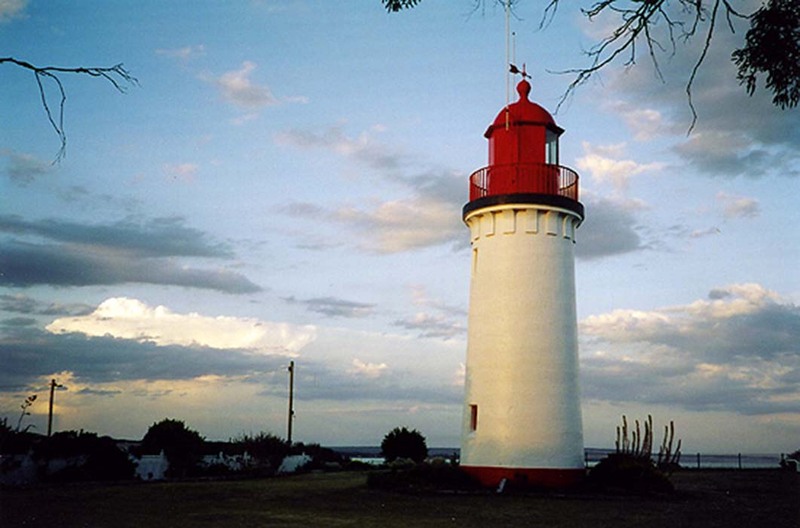 Whalers Bluff Lighthouse | Lighthouses of Australia Inc. The Whaler’s Bluff Lighthouse guides vessels past the treacherous Whaler’s Reef into the Portland Harbour. The Whalers Bluff Lighthouse was originally erected with keeper’s quarters on Battery Point in 1859 and was know as the Portland Bay Lighthouse. It was first lit in that year. The lantern is catadioptric made in England. The lighthouse relocated, stone by stone, to it’s current position on North Bluff (now Whaler’s Bluff) in 1889 to make way for gun emplacements on Battery Point. Another reason given for the relocation was that it was less vulnerable to attack on Whaler’s Bluff. “Lighthouse keepers are not, without authority, to permit views of defence works to be taken from the lighthouse towers or premises by photographers or others, and no information shall be supplied respecting such defence works”. No lighthouse accommodation is available.